A successful artist has record sales, radio play and a big house with a hot tub, right? Success isn’t always measured in dollars and cents though and all of those things directly trace back to money. 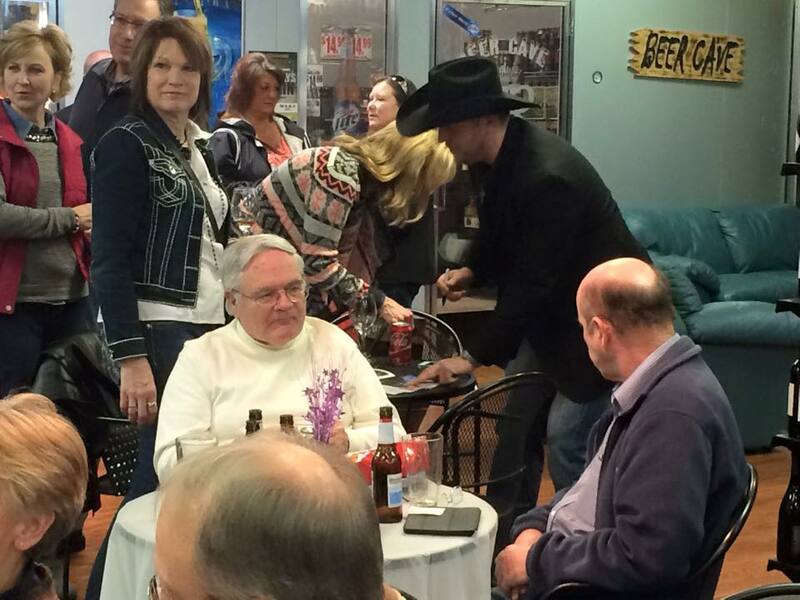 Phil Vandel is one of the more successful musicians in the area but many don’t know about him because he isn’t headlining shows in St. Joseph every month. His unique take on the music industry has carved him out a niche where he is extremely well known in certain circles without some of the normal markers of a successful music career. His brand of radio-friendly country music hits right on the mark in the Midwest as he maintains a following performing both originals and covers. He can be found playing solo acoustic or for many larger shows he will break out his full lineup in The Phil Vandel Band for a louder and more dominating set. This is the incarnation you will likely see playing events like fairs and reserving his solo shows for bars and more intimate environments. It isn’t a commitment every musician is willing to make to spend this much time on the road. Vandel’s commitment created situations of great uncertainty where he was along for the ride just to see where the road would lead him. “I missed more birthdays and holidays than I ever care to think about, there are prisoners that have spent more holidays with their families than I have.” He says with a laugh. During this time he was a part of several bands, countless shows and wrote and recorded a massive songbook that is now largely forgotten. 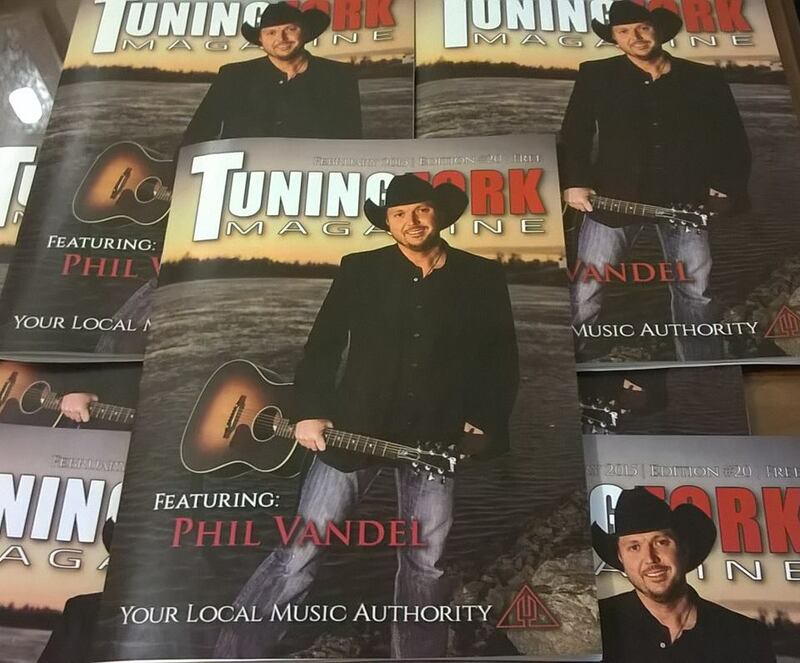 Phil Vandel signs copies of the Tuning Fork magazine he was on the cover of for February 2015. His extensive time on the road in his early days of playing music paved the way for the career he now calmly enjoys. He currently has no records to sell, no recording contract and doesn’t spend months out of each year touring anymore. Despite all of this he has made the proper connections and done all the right things to be able to play large shows in places like Texas and Las Vegas. Much of the clout he has gained comes from his tireless work to support military personnel, whether they be active or retired and especially his support of wounded warriors. Since that time his status has grown to where he is invited to play huge benefit shows to raise money for those who need it. He also has had several occasions where he has hopped a plain to play one song for returning soldiers. He and Matt Snook did this several times with their emotional original song “Welcome Home.” Vandel also gets involved in projects to play in front of a massive amount of people when opportunity knocks and because he has put in the time and treated good people right, that opportunity seems to knock a little more frequently for him. Recently he was chosen to write and record an original song for movie “The Hornet’s Nest” that was a starkly honest look at what American soldiers go though using real footage. His song he recorded for the soundtrack, “Tears of War” can be found right alongside high-profile artists such as Stevie Nicks and Kid Rock. Another project found him re-recording the 1974 Johnny Cash classic “Ragged Old Flag” and updating it for a DVD release of the video through the Non-Commissioned Officers Organization. The purpose of the video was to celebrate the illustrious tradition and journey of the United States flag. Vandel is a go-to name on projects like this because he has been there when groups trying to do good have needed him. This entry was posted in VOT Editorial and tagged Country, cover story, Heather Kirchhoff, Phil Vandel, Tuning Fork Magazine, Wounded Warriors. Bookmark the permalink.